A week after New York YIMBY co-investor Dan George was declared to be in contempt of court for failing to pay his partner Nikolai Fedak $30,000, George is trying to raise funds from subscribers of his new website, YIMBY News. George first brought a civil complaint against Fedak in federal court this January, alleging that Fedak “hijacked” the popular pro-development blog’s domain name. The suit claimed that Fedak’s erratic behavior and recklessness sabotaged the company and violated his employment agreement. Judge Paul Crotty, however, decided that the printed employer agreement George presented in the case constituted a forgery and ordered George to cover Fedak’s legal fees. The judge dismissed George’s complaint with prejudice. Citing an inability to pay, George tried to delay the full payment—he’s paid $5,000— until his appeal of the dismissal could be decided. But Crotty didn’t allow this and is holding George in civil contempt, court documents reviewed by The Real Deal show. The judge also wrote in the most recent order that if George doesn’t pay this time around, Fedak can move to have him incarcerated. On Tuesday, George sent out a personally written request for funds to YIMBY subscribers. Entitled “It’s Your Back Yard,” George wrote: “Today I am writing to request your financial support for the work that we do. Building YIMBY has come at a great expense. And while we’ve had great successes, we’re not even close to reaching our potential.” The letter does not mention any outstanding litigation or debts to Fedak. Fedak declined to comment for this story and George did not respond to a request for comment. 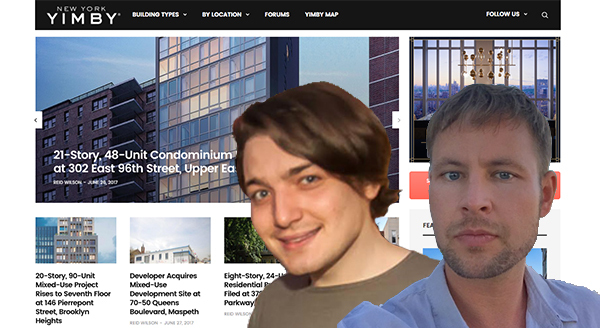 Fedak, who departed New York YIMBY’s Lower Manhattan office following the spat with George last fall, resumed posting on the site earlier this month after the site went dormant in February, when George moved his editorial staff to the new YimbyNews domain. Both sites use “New York YIMBY” on the masthead. Some of the complaints George brought in his original suit remain unresolved. These include the rights to the Yimby trademark and the nyyimby.com domain name. In order to press on with complaints that Fedak’s actions violated an employer agreement, George will have to produce the original copy, which George has said do not exist due to a company policy of scanning and storing signed documents and destroying originals. A court date to discuss these unresolved issues is scheduled for July 6.